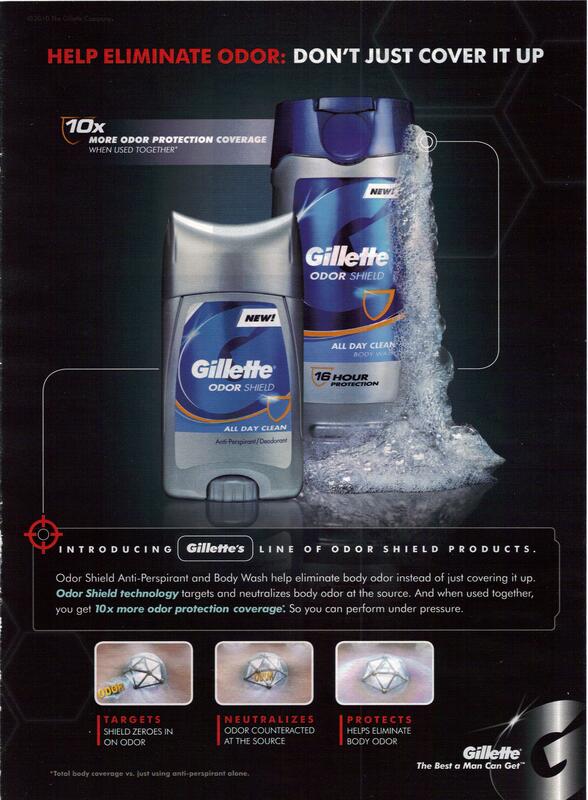 Gillette Odor Shield: Science and Technology! This is a magazine ad for Gillette Odor Shield deodorant and body wash for men. Help eliminate odor: don’t just cover it up. Introducing Gillette’s line of odor shield products. Odor Shield Anti-Perspirant and Body Wash help eliminate body odor instead of just covering it up. Odor shield technology targets and neutralizes body odor at the source. And when used together, you get 10X more odor protection coverage. So you can perform under pressure. This ad uses all of the hard-hitting “we use science!” cues that I’m used to seeing in ads for anti-aging makeup. It’s primarily black and red (what is it about black and red that suggests serious science to advertising designers? ), uses lots of outlines to direct your eye and suggest steps the product is going through in some sort of high-tech process, shows geometric shapes to suggest molecules or other “sciency” things, and gives completely unexplained numbers with no backing data (in this case – “10X more effective”). Does this promise of serious science and high technology give me any more faith in the product? Not really. If you actually read what it says, it’s basically saying what every single product that promises to reduce or prevent body odor says. This ad seems to be relying almost entirely on the “science” gimmick to sell it’s product. The problem is that science means data and data is one thing that is conspicuously absent from this ad. And that’s the problem. In this day and age I expect that every product I buy had science involved in its creation somewhere along the line, whether it was in the initial development, practical creation or testing for safety and effectiveness. Science isn’t a novelty – it’s the norm. So why is your science special? What does it tell us? If it shows that your product is more effective, then tell us how much more, how it’s more effective and why it’s more effective. And don’t forget that “more” is a relative term, so it’s vital that you tell us what it’s more effective than. Basically, if you’re selling me something on the basis of science, you’d better either be showing me science or data of some kind to explain why that’s such a selling point or I’m going to assume that “science” is a selling point because you never used it before, which makes me doubt both your credibility and reliability. Like I said – science is used in everything. Every food you buy at the grocery store (even the vegetables in the produce department that are marked “organic”) have science and technology behind their being there. So if you haven’t been using science until now to create a beauty product, I’m going to question the safety and validity of your products. So I think that this ad needs some major rethinking. Where did that “10X more effective” number come from? How is this any different from any other anti-perspirant? If you want to use data – use data. But stop with the red/black shorthand for science. Consumers are pretty savvy and can handle a few numbers. It might even impress some of them. But this technique is getting old. This entry was posted on May 12, 2010 at 12:00 pm	and is filed under Beauty. Tagged: body-wash, deodorant, gillette, odor-shield, print-ad, science. You can follow any responses to this entry through the RSS 2.0 feed. You can leave a response, or trackback from your own site. I don’t get a science vibe from this ad at all. The black and red scheme, the little target on the left, and all the verbiage say “sports hunting” to me. Words like “target, neutralize, eliminate, protect, and zero in” suggest a gun association. The only things that are remotely sciencey are “10x,” (simply because it’s a number), the hex pattern in the background, and maybe the word “technology” (which could also refer to guns), but those are pretty tenuous. And I don’t know if I’ve ever seen black and red as a color scheme for science. What comes to mind is more often white or brushed silver.